Are you in the market for a portfolio? Whether you’re constructing a portfolio to display your work as a barber, or you’re trying to get more clients for your web design freelance business, a portfolio is really the only way to get new customers. However, with the rise of mobile phone usage, you may find that a mobile app portfolio is even better than that of a website. After all, if you send a link to a potential client they have a good chance of opening up that link on a phone or tablet. They’ll quickly scroll through the images, then decide whether or not your business is the type that they’d like to work with. The main benefit of a portfolio is you can then keep reconnecting with the client, using coupons, new photo galleries, blogs posts, push notifications and social media updates to engage them and share information that they might find helpful. The point is, a mobile app is the perfect atmosphere for a portfolio, since it’s lightweight, powerful and filled with features for interacting with customers. It’s not easy to construct a portfolio app from scratch, but with the help of iBuildApp templates, and a little inspiration, you will be well on your way. That’s why we found some amazing portfolio apps created with iBuildApp. You can use these to think of features you haven’t added, while also improving on the overall design of your mobile app. 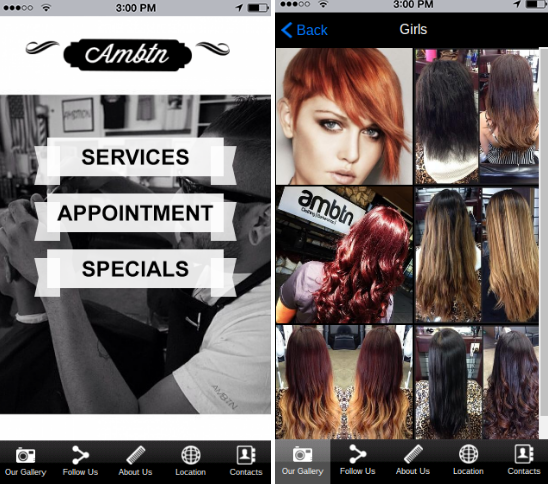 The AMBTN Barbershop app is a good place to look if you’re running a service-based company. The goal with this app is to share a gallery with the best hairstyles from the company, and it succeeds in doing so. We also enjoy that the homepage only includes three buttons, all of which point to pages that are going to improve sales. You can also check out the location of the shop and follow them on social media. 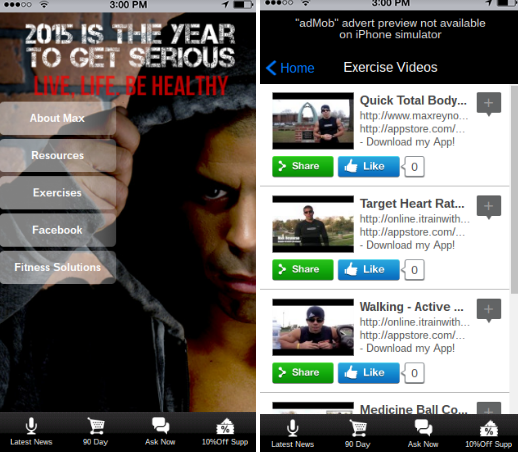 Lots of fitness companies use mobile apps to display imagery, video and more. 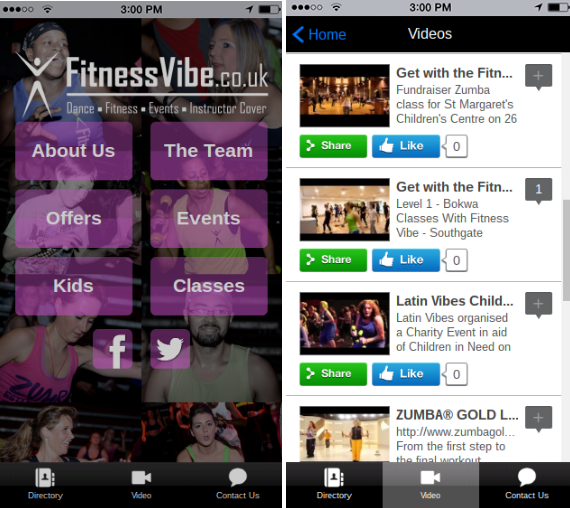 This one has a portfolio filled with videos, revealing what users can expect if they were to sign up for a fitness trail. Events are also displayed, and the directory is great for getting in contact with people and making the app more personalized. 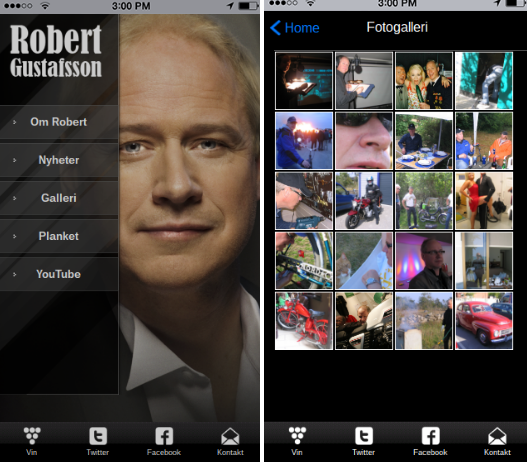 Here’s an app for a comedian and actor. He does a wonderful job of situating the buttons so that users see them clearly. Not to mention, his face is prominently shown so that no one mistakes him for someone else. A photo gallery portfolio is provided, along with YouTube videos of his acts. You can also find a contact form and social media buttons. 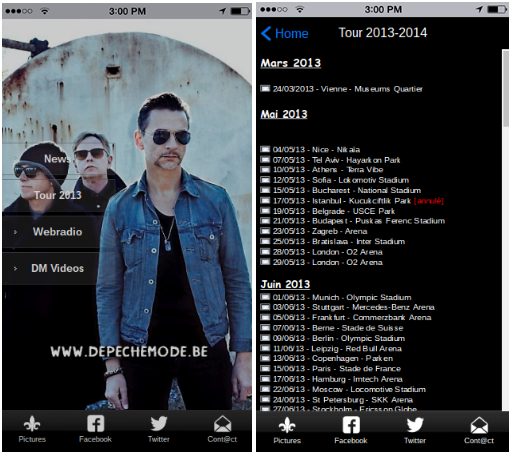 The Depeche Mode app covers portfolio information for a band, and we like it because they have links to social media pages, along with a solid list of tour dates. The News page works for updated content on the mobile app, but the web radio and video pages are obviously the most important part of the portfolio. Max the Fitness Expert is another good example of a portfolio for, you guessed it, a fitness expert. He includes a page for resources, which is nice for keeping customers around. Along with that he has some handy fitness videos, allowing people to view excercies and become more physically fit before signing up with Max.You should never underestimate free content as a means to bring in paying customers. 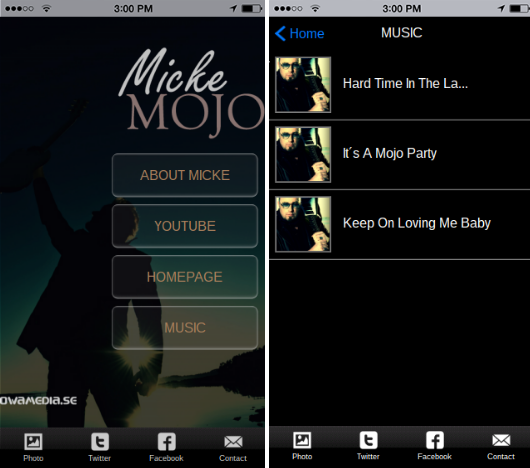 The Micke Mojo app not only looks beautiful, but it provides some awesome links to music and YouTube videos, seeing as how he is a musician trying to get the word out about his work. A photo gallery is also provided, giving you a good idea as to how you can utilize multiple media forms in your portfolios. Are You Making a Portfolio? If you currently have a portfolio, or if you plan on making one in the future, we recommend examining some of the best portfolio apps on the iBuildApp market. That way, you know where to get started, and you won’t be wondering why people aren’t interested in your app upon launching. If you have any questions about making a portfolio with iBuildApp, or if you’d like to share your own mobile app portfolio, feel free to drop a line in the comment section below.